Woot-woot! Happy Pi Day, friends! Or what we food bloggers like to call PIE Day. Because I am not so much into the whole Pi, 3.14 blah, blah, blah, deal. But I am definitely into pie! This Chocolate Mousse-Roasted Banana Cream Pie is inspired from a delicious, chunk of roasted banana cream pie I had last summer at The Black Pelican in the Outer Banks. 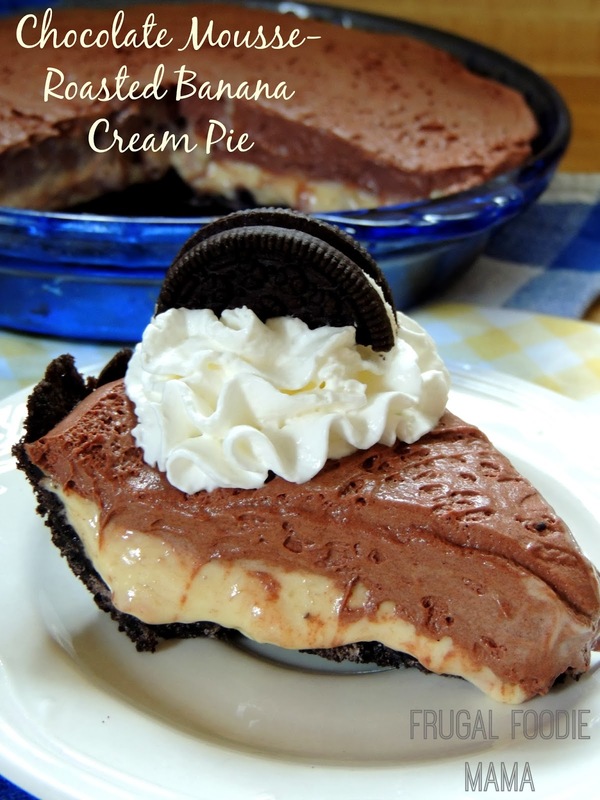 Their pie was this rich and creamy mile high cream pie made from roasted bananas and nestled in a thick Oreo cookie crust. I have literally been daydreaming about and googling how to recreate it since we walked out the door of that restaurant in July. 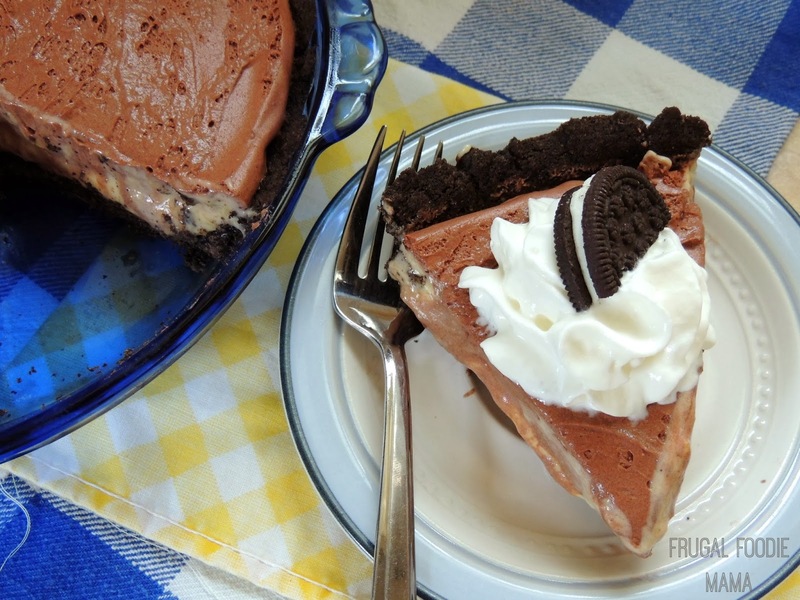 While I didn't exactly recreate their pie in this recipe, I did create my own take on it by adding a layer of chocolate mousse and making my roasted banana layer more custard like. And can I just talk about the whole roasted banana thing for a moment?? Preheat your oven to 400 degrees. Place the bananas, unpeeled on a foil lined baking sheet. Roast for 15 minutes. Let cool in the peels for at least 10 minutes. Turn down the heat in your oven to 325 degrees. While the roasted bananas are cooling, prepare the Oreo pie crust. Spray a pie plate with cooking spray. Set aside. In a medium mixing bowl, mix together the Oreo crumbs and melted butter until well combined. Press evenly into the prepared pie plate. Bake for 6-8 minutes. While the pie crust is cooling, prepare the roasted banana cream layer. Peel the roasted bananas and place in a medium bowl. Mash well. Set aside. Pour the 1 1/4 cups of cold milk in a large mixing bowl. Add the vanilla pudding mix. Beat on low for 30 seconds, and then on medium speed for 2-3 minutes until it starts to thicken a little. Now add in the mashed bananas and beat an additional 1-2 minutes. 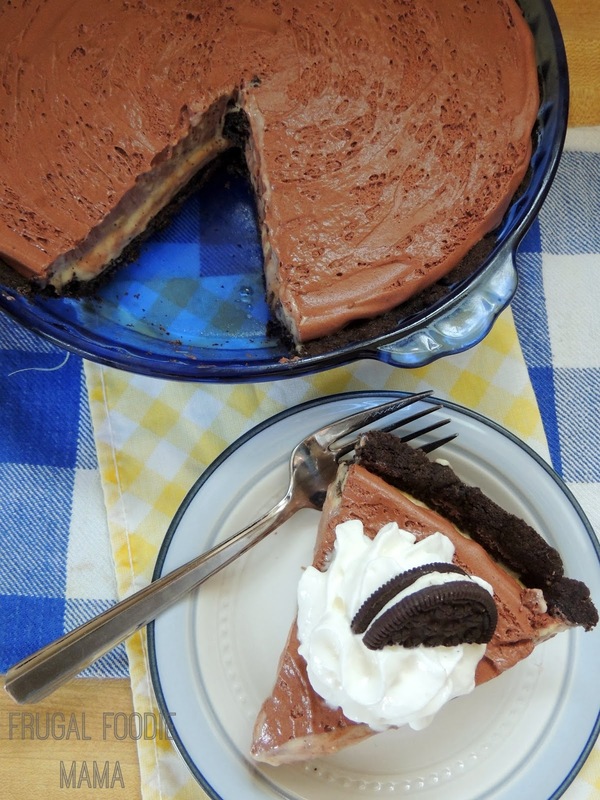 Pour into the cooled Oreo crust and chill in the fridge for at least one hour. Once the roasted banana cream layer is chilled, prepare the chocolate mousse according to the package directions. Evenly spread the chocolate mousse layer over top of the banana cream layer. Chill in the fridge for at least 2 hours to overnight. Cut into 8 even slices to serve. Top with whipped cream and an Oreo half, if desired. Store any leftover pie covered tightly in the refrigerator. I am not going to lie to you all... This pie is Rich. Yes, with a capital R.
Though I claim in the above recipe that it makes 8 slices, you can probably get away with smaller slices and thus more servings. How are you celebrating Pi (PIE) Day today? 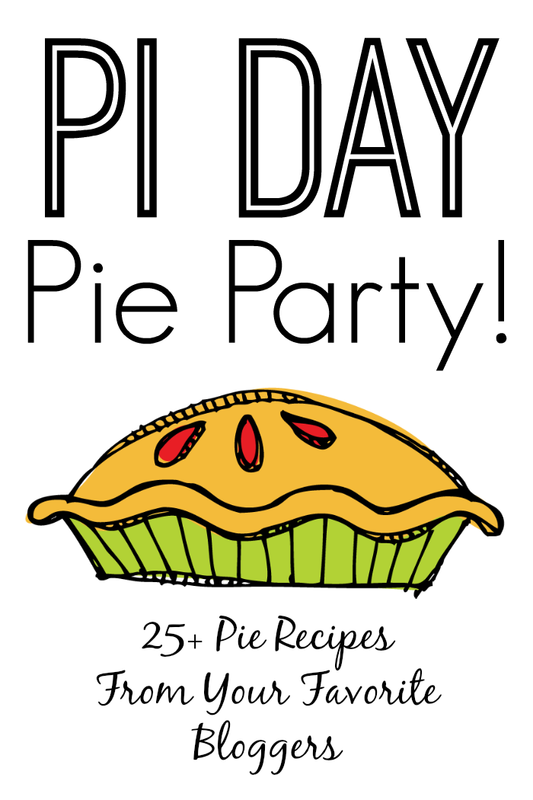 I have teamed up with over 25 other bloggers to host a Pi Day Pie Party! !